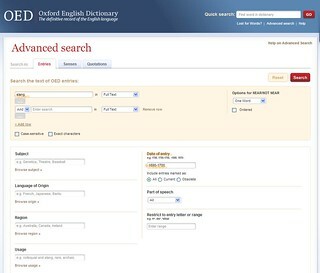 The Oxford English Dictionary is the online version of the 20 volume dictionary, containing 60,000 words and charting the course of the English language over the past 1000 years. The online version is easier to search than the print, contains more words, and can do lots of interesting stuff! This is a very powerful search that combines all of the search functionalities available. 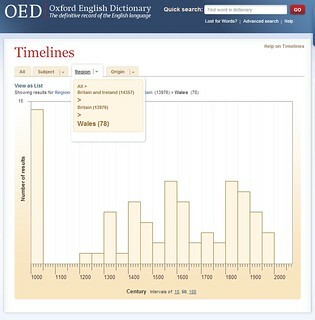 The timelines are a way of visualising when words came into English language usage. 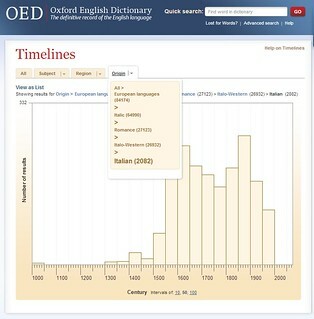 They can be found from the OED homepage. Follow the blog for essays on English Language, and try the quizzes– post your results in the comments below!